Our week is over here in Boston! We arrived pretty early...on time, actually! My friend LJ wanted to show me around, so we went walking down Massachusetts Avenue. We visited the Harvard Book Store, where LJ bought a book on the MLK assassination and I got a Neil Gaiman short story book. Soon after that LJ had to get back to the train (he's on floor crew, so he participates in load in), so I walked back with him and then set out again after lunch to visit some of the shops he'd pointed out. There were lots of cool stores, including this one that sold only honey and honey-related products. Heck, they had honey on tap!! The owner was there running the shop, and she was extremely knowledgeable and helpful. 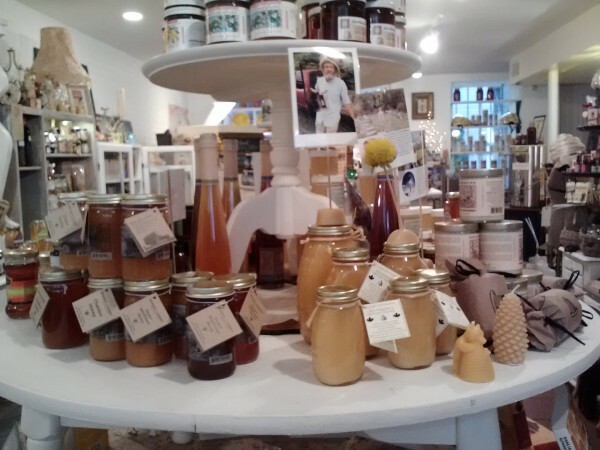 She had sample jars of almost every type of honey. We (myself and other shoppers) got to taste several kinds. It was exactly like a wine tasting but with honey instead! I can't tell you how many times I've seen some rare, exotic honey in the grocery and thought, "I'd like to try that!" but was thwarted by the insanely high price of honey coupled with the possibility that I might not like what I'd bought. This was a once-in-a-lifetime chance to satisfy my curiosity! I tried a local summer wildflower honey, buckwheat from Ohio, orange from Florida, lavender from France, chestnut from Granada, and best of all an extremely rare and pricey white volcanic flower honey from Hawaii. The chestnut was my favorite because it tasted bizarre. Go figure. After that I went back to the Harvard Book Store and picked up some bargain books from the used book section, then window-shopped until dark. The next day, I met my dear friend Erika for lunch. She and I lived together briefly in North Carolina while attending school. It's been about two years since we've spoken, and it was wonderful to reconnect this week. We went to Flour Bakery + Cafe, an EXTREMELY popular local lunch destination. It was PACKED when we got there, but we were still able to get our food within 30 minutes. She got the roasted lamb with tomato chutney and goat cheese, and I got the roast beef with horseradish and crunchy onions. We split a mini Boston cream pie cake. Delicious! After lunch, I walked Erika down part of our train, pointing out the elephant/horse cars, Chinese car, Pie car, etc. I also showed her my little room, and the 'band' train car that houses 6 of the 9 band members. Then Erika took me to her workplace! 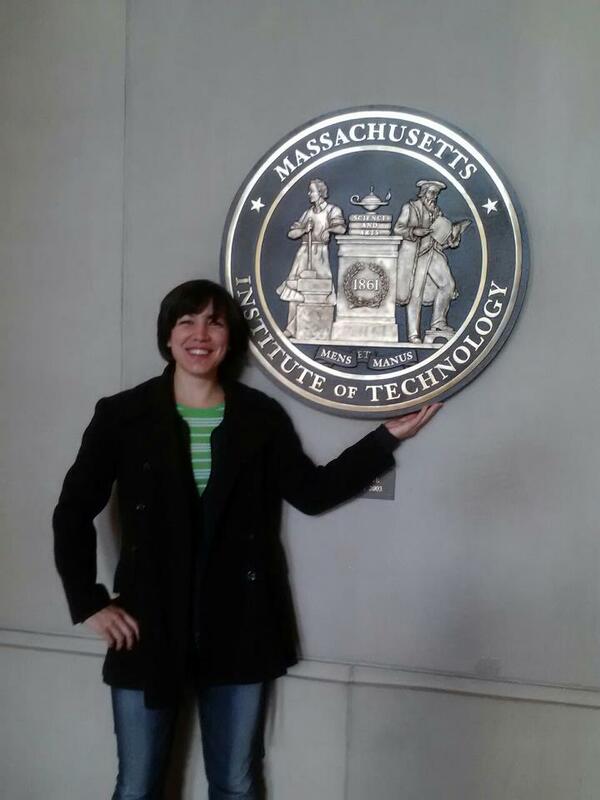 Yep, she works at MIT! Specifically, she works on finding a cure for malaria. 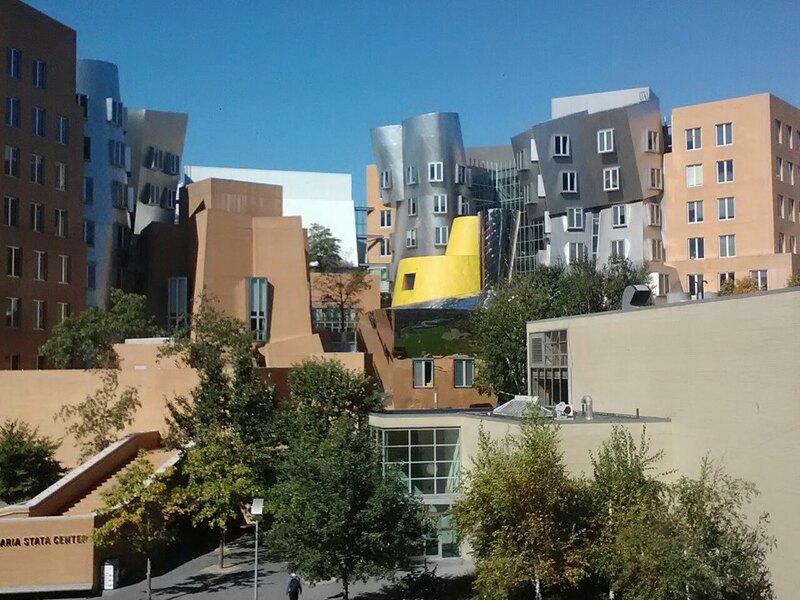 She showed me her department offices, which have a great view of the Ray and Maria Stata Center. Then I got to see malaria under a microscope!!! Of course I don't have a picture of that, but it looked something like this. It was pretty amazing. I'm glad I don't have malaria. Afterward we went to Boston Beer Works, a popular hang right across from the TD Garden. They got dinner. 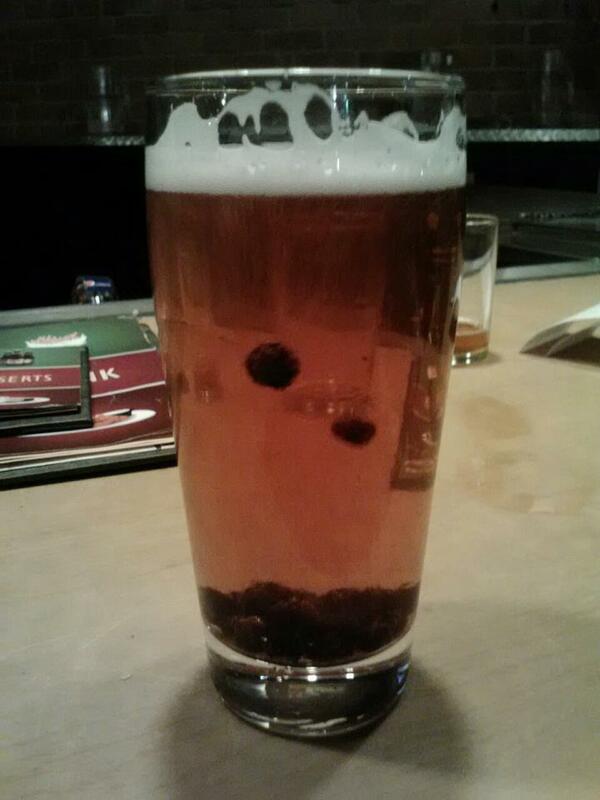 I got a blueberry ale. Anyone can tell you I'm not a beer person, but this was pretty good. We reminisced about college days and talked about our plans for the future. The next day I set out determined to walk the entire Freedom Trail! It was very rainy and cold. I did the best I could, but between the weather and getting distracted by every little side street (Boston has a lot of those), I only ended up seeing about half of it. Before embarking on the marked path, I made a stop at Mike's Pastry in the North End. This bakery is wildly popular with tourists and natives alike, and every time I passed it this week there was a line either at or out the door. After a summer spent in the southwest, it was high time for a classic black and white cookie. Ok, THEN it was time for the Freedom Trail! I followed it to Faneuil Hall/Quincy Market, a shopping plaza in the 1700s and still a shopping plaza present day. I got totally sidetracked with window shopping and the massive farmers market taking place on a nearby street. An hour or two later I resumed my trek and found the Paul Revere Mall. My pictures turned out lousy thanks to the lousy weather, but there are plenty of pics online. It's the church where Revere's lanterns were hung to warn the country of the impending British invasion. It was amazing to see it in person! 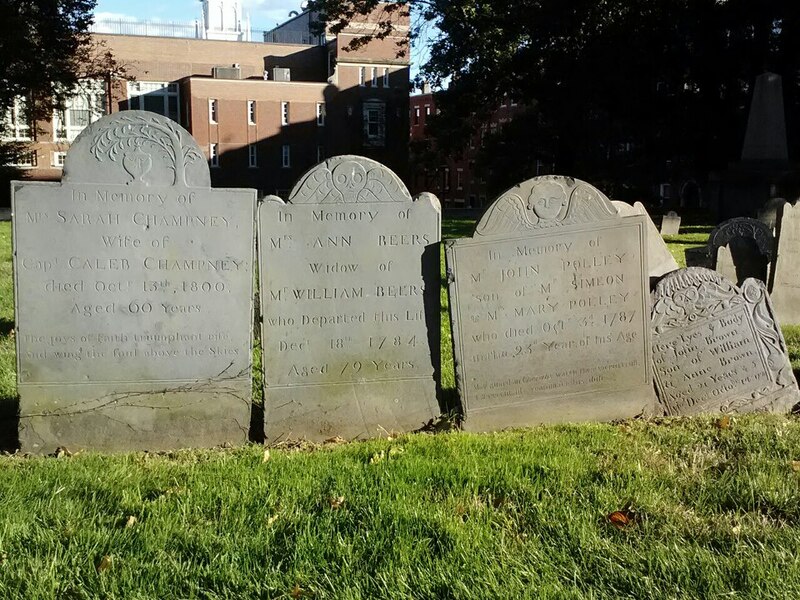 Next I had intended to see Paul Revere's house, but never made it because I took a wrong turn somewhere and ended up in Copp's Hill Burying Ground. Copp's Hill is Boston's second-oldest burial site. I took this picture because it illustrates several styles of headstone...two with winged skulls symbolizing a somewhat morbid/pessimistic view of the soul's ascension; one with a winged cherub head (more positive interpretation of the same idea); and one with an urn and willow, symbols of death and mourning. Though most of the headstones in this yard used the same symbols, each one was unique and a variety of carving skill levels were apparent. 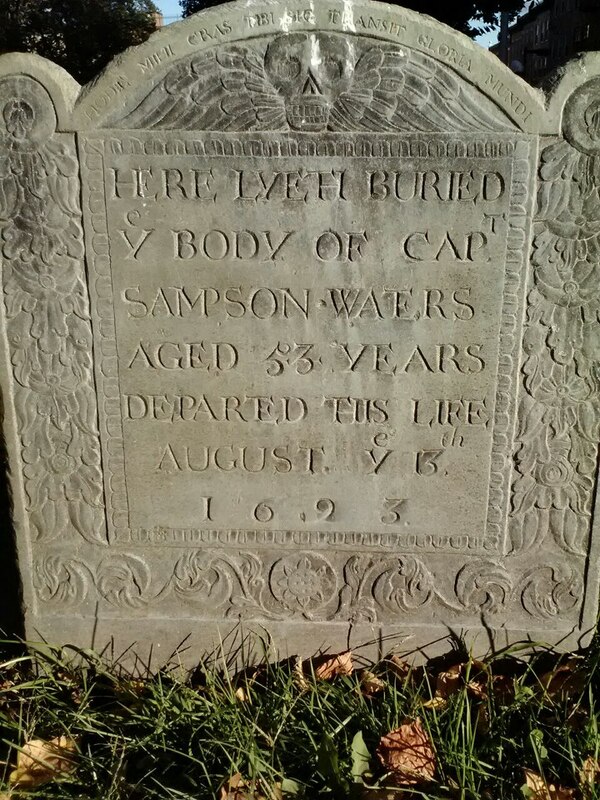 This was the oldest headstone that I saw (I'm sure there were older). It's very ornate. The way some of the letters share an upright stroke is interesting too. The phrase across the top reads, "My turn today, yours tomorrow. And thus passes the glory of the World". This was about all I saw as far as the Freedom Trail was concerned. The rest of the day was spent exploring side-alleys and adorable Italian shops and bistros. Today (Sunday) I got to reunite with a fellow musician from the 2010 Handel's Messiah Rocks tour. He brought two friends to the show, and between shows we went out for coffee and gelato near the venue. We didn't have much time, but it was good to see him! The rest of my week was spent thinking ahead to the end of this year's show. I'm putting together a box of stuff to sell and/or give away, and beginning to pack and plan for the trip home. I'm also trying to buy fewer perishable groceries in the hopes that I can defrost my freezer over the break. At first I wasn't going to buy bread here, but waaaay back in the corner of the grocery was this little shelf full of bread from local Big Sky Bakery. There was something called "Borodinsky" bread...it's a dark Russian rye with coriander. I've already had a slice, and it's spicy and moist and very rich (130 calories per slice!) and delicious. I can't really describe what coriander tastes like...nutty and zesty, maybe? You should try it! I'm not sure what you're supposed to eat with it, but I'll bet it'd be awesome with any kind of meat and especially with salmon. Also while researching this type of bread, I found out that stale rye is used to make Kvass, a traditional Eastern European drink. The More You Know! 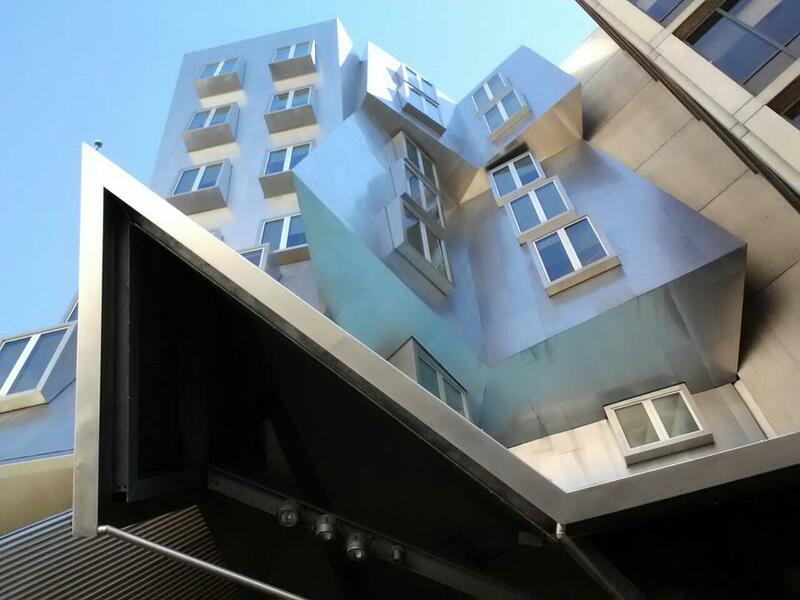 Boston is one of my all-time fave places to visit. And I had no idea there was so many different types of honey! Next time I've got to do more exploring there! There were TONS of honeys! From anything that has a flower, really...cacti, various fruits and grasses and grains. The lavender honey tasted like perfume; the flavor stayed in my mouth for like an hour haha.